Cyclists and drivers travel busy streets in Medford. Many are commuters heading to Somerville, Cambridge or Boston. Drivers have a responsibility to share the road with cyclists and yield to them when they have the right of way. When they neglect to do so, cyclists can suffer serious injuries. We hope you are never injured, but if you are, Breakstone, White & Gluck can help. Our attorneys have over 100 years combined experience representing cyclists who have been injured in Massachusetts. We are known for our top results in representing injured cyclists and our commitment to protecting cyclists of all ages. Since 2013, our Project KidSafe campaign has donated over 10,000 bicycle helmets to children in the Boston area. Helmets save lives and are critical for every cyclist. We are also active supporters of bicycle organizations and bicycle clubs, for more than 20 years. If you have been injured, contact our attorneys for a free legal consultation at 800-379-1244. We can answer your questions and help you determine if you have a potential claim against the driver for your injuries. 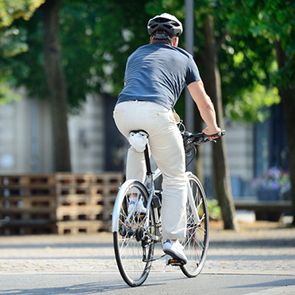 We know the stakes are high when you choose a bicycle accident lawyer. You want to choose the most experienced lawyer you can to represent your best interests. Read our client reviews from Google. Read our bicycle accident results for clients. Medford has a population of 57,000 residents and is located along the Mystic River, a few miles northwest of Boston. It is part of Middlesex County and borders Winchester, Arlington, Somerville, Malden and Everett. It is home to Tufts University on the Medford and Somerville border and the Middlesex Fells Reservation. Residents can catch the MBTA Orange Line train from Wellington Station into Boston, and there is bus service. But over the years, as traffic congestion has increased in the Boston area, many residents have chosen to travel by bike. As cycling has increased, so have bicycle accidents in the Boston area, including in Medford. In 2014, a cyclist was hit and killed on the Mystic Valley Parkway in Medford, between Hastings Lane and Daly Road, drawing attention to risks cyclists face in that area. The Medford Bicycle Advisory Commission and the City of Medford have committed to improving cycling infrastructure across the city to make riding easier and safer. In 2015, the city announced new bike lanes would be built near Medford High School and Medford Vocational Technical High School. In addition, the city committed to adding Shared Lane Markings or “sharrows” on the roads and signs reading “Bicycles May Use Full Lane” on many local streets. The Medford Bicycle Advisory Commission (Medford Bikes) is active in promoting bicycle safety, maintaining an informative website, conducting annual cyclist counts and organizing community events on safe riding techniques. Breakstone, White & Gluck has partnered with Medford Bikes through our Project KidSafe campaign, donating bicycle helmets for kids at Medford Day. New infrastructure can help protect cyclists, but bicycle accidents​ can still happen when drivers make mistakes or are reckless. If you are injured, visit a hospital emergency room or contact your primary care doctor immediately. Then, contact an attorney to learn your rights for seeking compensation. There is a Statute of Limitations in Massachusetts and you have a limited amount of time to file a claim. The Medford bicycle accident lawyers of Breakstone, White & Gluck represent cyclists who have been injured by negligent drivers. For a free legal consultation, contact our attorneys at 800-379-1244 or 617-723-7676 or use our contact form.